LG announced the worldwide opening of 3D World, a premium content service that will be available to LG’s CINEMA 3D Smart TV users in nearly 70 countries. 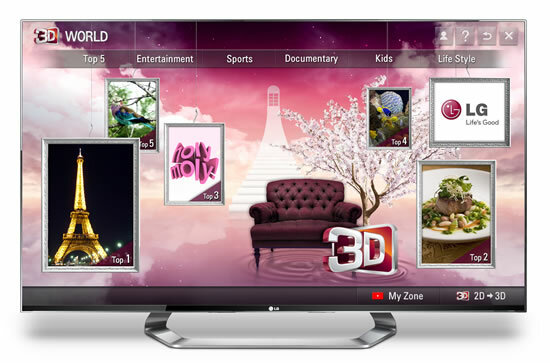 With DNA from LG’s original 3D Zone Smart TV app launched last year, 3D World gives LG customers access to an expansive selection of high quality 3D content via a card on the Home Dashboard. 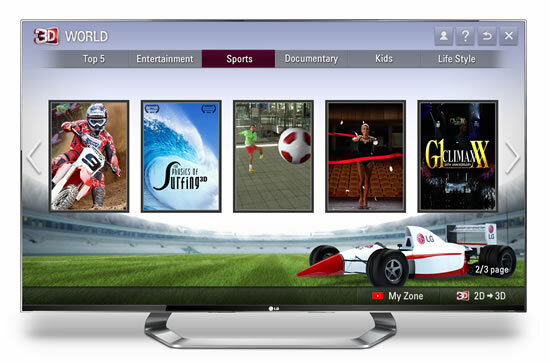 LG 3D World allows customers the ability to search through high quality 3D content across numerous content categories such as entertainment, sports, documentary, kids, and lifestyle. Once the content is selected, LG’s CINEMA 3D Smart TV brings it to life in beautifully rendered 3D images. The action scenes in sports become more dynamic and exciting, documentaries more realistic, educational videos in the kids’ category more captivating. Whether it’s cooking, travel, fashion or any other interest, there’s something for everyone. In addition to the content, LG plans to pursue further collaborations with global 3D content providers in order to bring the most sought after 3D content to LG customers. LG 3D World will be offered in app-format for CINEMA 3D Smart TVs that were produced in 2011, while 2012 models will use the streamlined card system on the Home Dashboard.